A term that has not been studied for the question of Athenian female citizenship is the adjective kurios. Rather than focus on the substantivized and technical use of the term as a female’s guardian, this article explores the wider applications of the word kurios, particularly as an expression of power over property, the continuation of the oikos, and its connotations for citizenship. Women are in fact called kuriai over property in forensic speeches (D. 27.53, D. 45.74, [D.] 50.60, Is. 10.23, Is. 6.30). Examining these passages, I argue that women’s power over property has legal connotations and is further proof of a female citizenship that shared facets with male citizenship. After some initial remarks on the paratactic-catalogic structure of Triphiodorus’ Ἰλίου Ἅλωσις, the present paper discusses elements of the structure and content of the catalogues of lines 152–83 and 17–39 of Triphiodorus’ poem. It is argued that, within the general Homeric background of Triphiodorus’ catalogues, echoes of Apollonius’ catalogue of the Argonauts (1.23–228) can be traced in Triphiodorus’ lines. It is further demonstrated that for the presentation of Neoptolemus in lines 53–4 and in the catalogue of the Achaeans of the Horse, Triphiodorus is influenced by the description of another young warrior, Meleager, son of Oeleus, in A. R. 3.518–20. Triphiodorus does not merely imitate Apollonius, as he also does not copy Homer: the partial combination of elements taken from his two epic predecessors helps him create a novel style while he catalogues his heroes, adjusted to the specific narrative circumstances that he establishes. 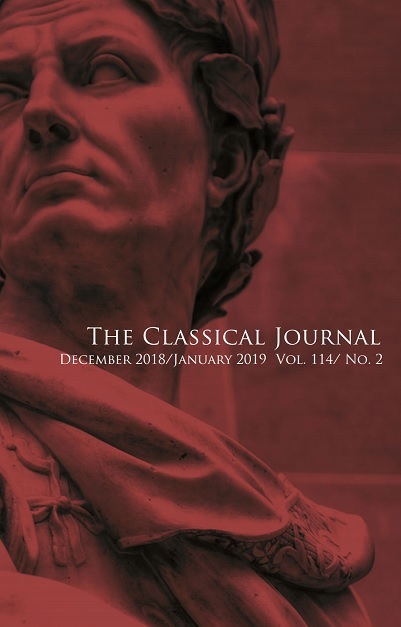 This article examines the Battle of Zama in 202, which ended the Second Punic War (218–201) between Rome and Carthage. It argues that the maneuvers described by Polybius are most intelligible if Hannibal sought to corral Scipio into a trap formed by an extended third infantry line, perhaps aided by terrain. Scipio escaped by hastily extending his own forces, holding out until his superior cavalry enveloped Hannibal in turn. This article is intended to contribute to an emerging debate regarding the proper contents and shape of a digital apparatus criticus. I argue that Keeline (2017) offers what are in fact two very different proposals for such an apparatus, one of which will likely serve our interests as a profession far more effectively than the other. Keeline treats the general contemporary tendency to disregard the critical apparatus in printed texts as a problem that must be corrected. I suggest that it is better understood as a reasonable response to the enormous intellectual expansion of the field of classical studies over the last few generations, and that it is accordingly unlikely to respond to changes in the architecture of the critical apparatus in any format.